Like every other B2B Marketer you need to generate a constant stream of qualified leads for your sales team. Are you finding traditional marketing tactics are no longer as effective as they used to be? It’s because your audience don’t want interruptions and so only a small percentage will ever respond to your outbound efforts. Increasingly, web-savvy prospects start their buying journey independently. They research for the products and services they need long before they engage with sales people. So how will they find your company and your offerings? Are you leveraging Inbound Marketing and Social Media to generate Sales qualified leads? - Which channels are relevant to you? - What results can you expect? - Where should you start? - What happens after leads covert? 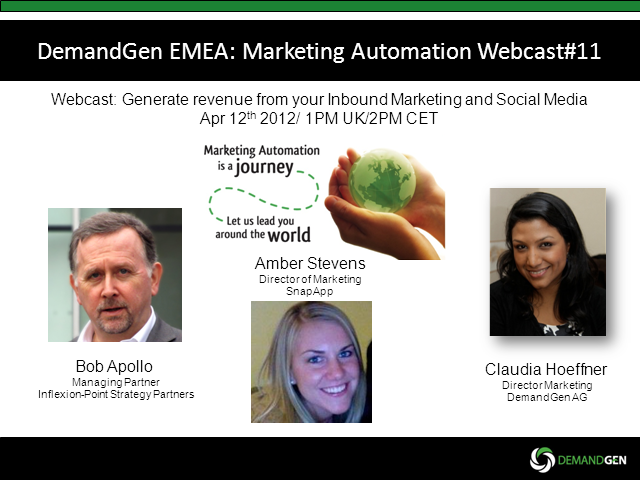 Attend the webcast, learn from the case study and start building your own Inbound Marketing blueprint.